Gabrielle Douglas is aiming to become the first gymnast in close to 50 years to win consecutive Olympic gold medals and plans to let reality television cameras film the process for Oxygen network. Douglas, 19, made history at the Olympics when she became the first African-American All-Around Olympic Gold medalist and the first female to win both all-around and team gold medals at the same Olympics in 2012. With new goals in mind, Douglas and her manager mother are gearing up to star in the tentatively titled series, "Douglas Family Gold." 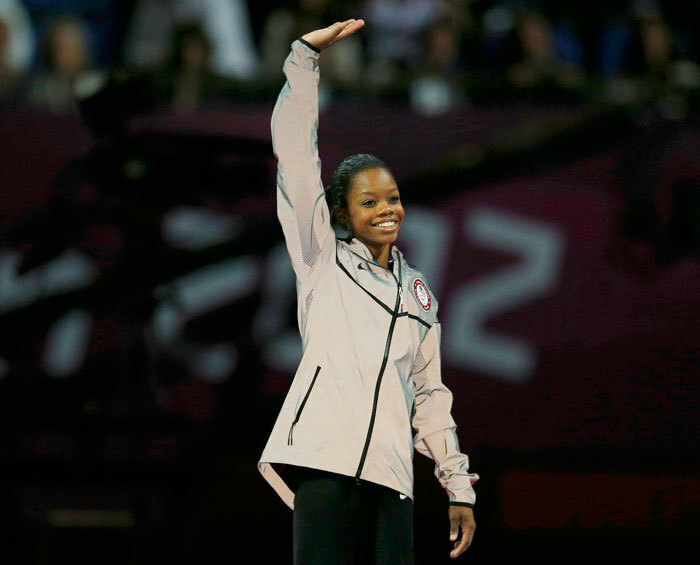 "Gabrielle 'Gabby' Douglas stunned the world in 2012 by becoming the first African American in history to win the individual all-around gold medal at the Summer Olympics. Behind her meteoric rise was a supportive family willing to sacrifice everything for years to help her dream," a release from Oxygen media reads. "Now 19, Gabby is ready to do it all over again in hopes of making it back to the medal podium in 2016. The bi-coastal Douglas family shuttles between California and Ohio to support Gabby's training regimen while also juggling their own lives." It seems Gabby is not the only busy member of her family, according to the show's synopsis. "Her brother John is the family's second Olympic hopeful in track and field, while devoted sisters Arie and Joy are eager to blaze their own paths," the synopsis states. "'Momager' Natalie keeps this tight-knit family in-check, knowing regardless of what happens, 'Team Douglas' has already won gold." The official air date for the tentatively titled reality television show has yet to be announced. After releasing her first book, Grace, Gold and Glory in 2012, Douglas opened up to The Christian Post about how her faith has contributed to her success. "It was definitely important for me to praise God because He's given me this God-given talent to go out there and represent Him and share my faith with everyone," Douglas previously told CP. "I mean I'm not going to hold it in because He's blessed me so much throughout my gymnastics career. He's woken me up every single morning and He's just been so great to me, so I'm going to go and share it with everyone because it's a part of me and it's just who I am."